What is a DE Filter and How Does It Work? Are you looking for a great way to keep your swimming pool clean for a long time to come? Are you tired of spending a lot of money on replacing cartridge filter media every few months? 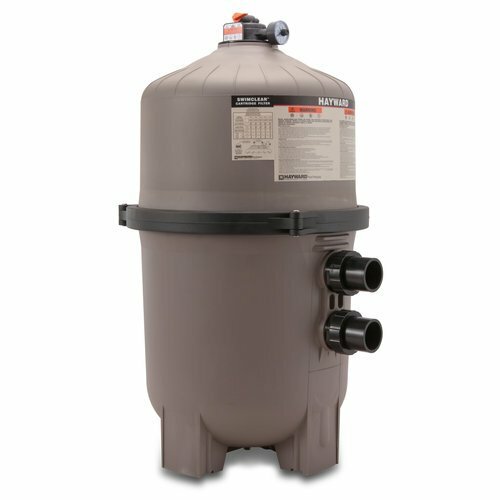 Do you think sand filters and cartridge filters both are just too much of a hassle? If so, diatomaceous earth filters for pools are just what you need! Diatomaceous earth, or DE, has recently become a very popular method of filtering swimming pool and hot tub water. These filters may be a little more expensive for the initial installation, but they can save a ton of money in the long run. In this article, you’ll be introduced to DE filters and learn all about how they work. You’ll also find out the advantages and disadvantages of these types of filters, and you’ll discover the five best ones on the market today. Are you ready to get started? Let’s begin! Last update on 2019-04-21 at 17:36 Product prices and availability are accurate as of the date/time indicated and are subject to change. Any price and availability information displayed on [relevant Amazon Site(s), as applicable] at the time of purchase will apply to the purchase of this product. A diatomaceous earth pool filter is a very efficient swimming pool filter designed to filter your water down to only 3 to 5 microns. This is significantly more filtration than any other type of pool filter can provide. These filters look like large canisters that seal shut and can be attached to the pool’s water pipes. Inside the canister, there is a pronged manifold piece that has individual grids attached to each prong. The way a DE filter works is similar to a cartridge filter, with one major difference. First of all, the filter measures how much filtration the water needs by monitoring the pressure inside the filter at any given time. A pressure gauge is an important part of the whole setup, and most DE filters come with one. The manifold inside the tank has several fabric grids, which are very similar to the pleated media in a cartridge filter. When the filter is set up, DE is poured into the tank and allowed to move around until it settles on the fabric grids. Once there, it can filter out contaminants much more effectively than the grids themselves can. Because of this, the DE is considered the actual filter media in this type of filter, and not the fabric grids. Diatomaceous earth filters for swimming pools have several advantages and disadvantages both. Anyone who owns one will tell you that the pros far outweigh the cons, but if you haven’t purchased one yet and you’re trying to make a decision, it’s a good idea to keep everything in mind when it comes to shopping for your new filter. They’re very cost-effective in the long run. Replacement grids and DE don’t cost a lot, so over time, they can be very affordable. They can get your water cleaner than other filters. They’re currently the strongest and most powerful type of pool filtration on the market. They’re easy to clean. You can usually take care of the whole cleaning and recharging process in 30-45 minutes. They come with everything you need to get started. This includes the pressure gauge and starter grids. They need to be cleaned every month. They do require more frequent full cleanings and recharging than other types of filters do. This is part of what helps keep them functioning for so much longer than other filters. They can be very expensive at startup. These are costly filter units when you first install them. However, the savings over time can more than make up for it. Repairs can be costly in some instances. For some filters, replacement pieces and repairs when something breaks can be a little expensive. This doesn’t include the cost of regular grid replacements, however. Are you ready to find the best DE pool filter for your needs? In the following section, you’ll find five of the number one DE filters on the market today. You’ll be able to see which ones are the most cost-effective and which ones come with a lot of extra bells and whistles you might be interested in. Be sure to take a look at the pros and cons of each one to help you find the right fit for you and your pool. 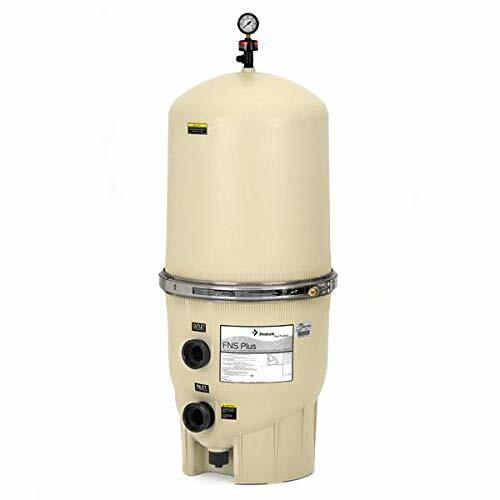 For the most cost-effective and highest quality DE filter on the market today, check out the Hayward EC50AC Perflex Extended-Cycle Above-Ground/In-Ground Filter. This filter is perfect for round and oval pools, and since it can be used on both in-ground and above ground varieties, it’s a great all-around pool filter that works well for most backyard swimming pools. It’s built to stand up to repeated use with no signs of wear and tear, and it’s resistant to all types of pool treatment chemicals. Great at keeping your pool crystal clear for months at a time with very little maintenance. Lightweight design and small size make this filter easy to work with even when it’s full of water. Includes a handle that allows you to easily coat your filter grids with DE as needed. If your filter sits in direct sunlight, it may be prone to cracking and splitting. May take several days to completely clean your pool the first time. May cause DE to wash into your swimming pool, especially without regular maintenance. 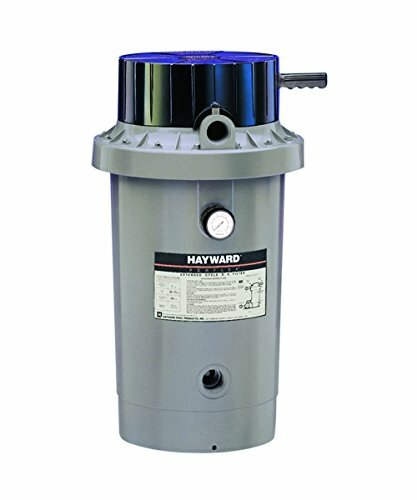 If you’re searching for a smaller pool filter that works just as well as bigger DE filter options, look no further than the Hayward EC65A DE Complete Pool Filter. This is a 27-square foot filter that can operate on a fairly small amount of diatomaceous earth, which means you’ll be saving money in the long run without having to purchase a lot more DE. Although it isn’t large enough for very big pools, it’s perfect for common pool sizes. Best of all, you can use this filter with any brand or type of pool you might have, and it works for some above-ground options as well as in-ground ones. Can get even the dirtiest of pool water clean and clear within one to two days from initial setup. Easy to perform the backwash with the push of a button. Very easy to install, whether you’ve had experience putting in filters or not. Some products have been known to develop leaks around the seal, especially after extended use. This filter is very difficult to take apart for regular cleaning, as opposed to some of the other models on this list. In some products, the manifold fingers have been known to arrive broken. The Pentair 188592 Quad DE Cartridge Style Pool Filter features a durable design that’s built to last for a long time. This filter is made to be resistant to all pool treatment chemicals, so even if you use a few in your pool water on a regular basis, you should have no trouble keeping this filter operating well for years to come. With four cartridge filters inside the tank, this filter is ready to work hard for you. This filter operates on a system utilizing cartridge filter pieces instead of traditional DE filter grids, but the functionality is more or less the same. Comes complete with the pump, accessories, and everything you need to install and use the filter right away. Very easy to clean without having to remove several individual parts separately from one another. Despite being a mid-sized filter, this one does not require too much DE in order to function properly. Included cartridge filter media may arrive cracked and damaged, although the company will replace these for free if so. Has been known to cause DE to float into the pool water, especially without regular maintenance. May be more costly to replace cartridge filter pieces than grid style filters. 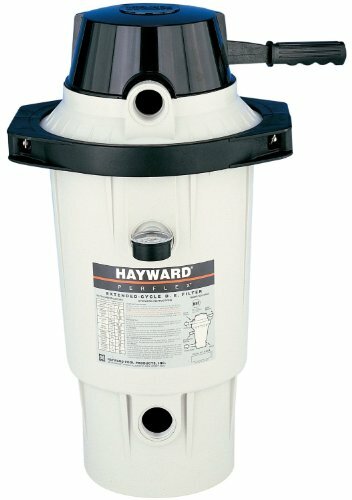 If you’re looking for a very sturdy and well-built DE filter with tons of great customer service and quality products backed by a well-known name brand in the industry, look no further than the Hayward DE6020 ProGride DE Pool Filter. This filter is available in five different sizes to help you find the right fit for your pool. Choose between 24, 36, 48, 60, and even a hard-to-find 72 square foot model based on the size of your pool. This is a durable, sturdy filter that’s sure to keep you and your whole family swimming in safe, clean water for a long time to come. Capable of fully cleaning a pool within 1 to 2 days after initial setup and installation. Easy to use design is made for simple media and DE replacement without a lot of complicated operation. Includes a plastic gauge that won’t crack or stop functioning even in inclement weather. Does not come with the required backwash valve that allows you to properly maintenance this filter. Some products have been known to arrive cracked on the inside, although the company will replace this if it happens. The inner workings of this filter may be a little more flimsy than some other filters on the market and may become cracked and damaged more easily. 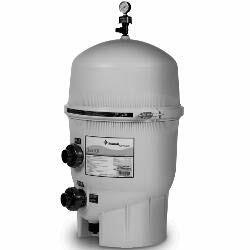 The Pentair 180009 FNS Plus DE Pool Filter is a powerful, durable 60 square foot filter that’s perfect for very large swimming pools. It is designed to make cleanup even easier than ever before, and it’s simple enough to install that it won’t take long before your pool is clear and ready to swim in. This is one of the largest and most DE expensive filters on the market today, but it’s also one of the most popular because of its well-known brand name and long lifespan. Easy to hook up with just two simple connections that even an inexperienced pool owner can perform with no trouble. Everything you need to get started is included with this filter, so you won’t have to make any extra purchases. This filter is designed to hold up to plenty of use even if you install it in direct sunlight. The seal around the filter has been known to leak, especially after extended use. Some products have been known to arrive cracked and damaged in some rare instances. This filter does require more DE for operation than many others listed here. As you can see, swimming pool DE filters have a lot of great uses and there are plenty of reasons why you might want to bring one home today. A DE filter is best for pool owners who want to save a lot of money in the long run in terms of filter operation and who want to get their water cleaner than ever before. When you use a DE filter, you don’t have to worry about adding a microfilter to improve the quality of your water. In some cases, you might not even need a lot of harsh pool treatment chemicals to get your water sparkling and clean every time you use your pool. When you’re ready to purchase your DE filter, don’t forget the five great options listed above. Bring one of those products home and you’ll be well on your way to perfectly filtered pool water you’ll feel safe using. Your friends, your family, and your pool will thank you!